Situated on the Chobe River in the North Eastern corner of Botswana's Chobe National Park, and twenty kilometers upstream from the confluence of the Chobe and Zambezi rivers is a place where the dust speaks of an ancient time, a time when the scent of the dust meant survival or death. Situated on the Chobe River in the North Eastern corner of Botswana's Chobe National Park, and twenty kilometers upstream from the confluence of the Chobe and Zambezi rivers is a place where the dust speaks of an ancient time, a time when the scent of the dust meant survival or death. It is home to the largest concentration of Elephant in Africa and during the dry season the herds congregate along the fertile flood plains of the Chobe River. Large herds of Buffalo also concentrate on the floodplains during the dry season. Other major species such as Lion, Wild Dog, Puku, Red Lechwe, Sable and Roan Antelope are encountered in many areas of the reserve. 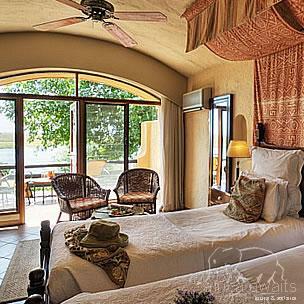 This 48 roomed lodge overlooks the Chobe River and Caprivi floodplains. The architecture is Moorish and graceful - high arches, barrel-vault ceilings and tiled floors creating an atmosphere of spaciousness and tranquillity. All 48 rooms are tastefully furnished, each room with hand crafted Rhodesian teak furniture and walls decorated with original African carvings and paintings. Chobe Game Lodge has 4 luxury suites, each with a private swimming pool set on a secluded terrace with breathtaking panoramic views of the open plains. The Lodge can accommodate up to 100 people in total luxury and caters for children of all ages. Facilities within the lodge include a well-stocked curio shop, wildlife reference library and a stylish Tshwene bar with full-sized Victorian pool tables overlooking the floodplains. The Chobe Game Lodges boma (outdoor eating area enclosed by reed walls) is situated under large Mahogany trees on the banks of the Chobe River. Like the rooms, the boma has been furnished in teak and leather. Other facilities include a large swimming pool with a terrace, a riverside boma area where traditional dancers perform, a fully equipped conference room, a business centre, a stylish bar with an outside terrace overlooking the Chobe River and a cigar bar with a full sized billiard table. Meals are catered for at the terrace restaurant overlooking the Chobe River. 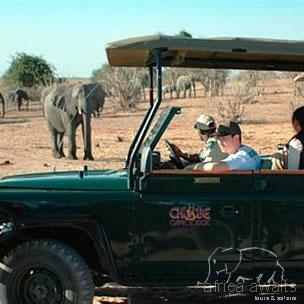 Chobe Game Lodge game drives are conducted in open sided 4x4 vehicles ensuring maximum visibility. Guests can also enjoy a romantic sunset cruise down the Chobe River. Cruises on small boats or aboard the Mosi-oa-Tunya, afford spectacular wildlife viewing and enable you to experience unforgettable African sunsets. Game viewing on the Chobe River is conducted by small, shallow draft and highly maneuverable boats piloted by expert boatmen. Your resident professional guides offer slide shows, star gazing presentations, garden and river walks as well as walking safaris in the nearby Kasane forests. With your holiday, safari or business trip from in to Chobe Game Lodge in Botswana.